Donald Macgregor (born 23rd July 1939) is one of Scotland’s most distinguished athletes. He won five Scottish titles (6 and 10 miles on the track and three marathons), ran for Scotland in the International Cross-Country Championships, and represented GB with distinction in several important marathons, including Kosice (Czechoslovakia), Karl-Marx Stadt (East Germany) and Fukuoka (Japan). Donald ran for Scotland in two Commonwealth Games marathons; Edinburgh 1970 (8th) and Christchurch 1974 (6th in his fastest-ever 2.14.15.4). In 1970 he ran 23 miles 971 yards in two hours on the Pitreavie track – only 100 yards less than Jim Alder’s World Record. However his finest achievement was (aged 33) in the Munich Olympic marathon in 1972. In preparation for the Maxol Marathon British trial, as well as averaging ninety miles per week, he tried two consecutive 120 mile weeks, a month before the race. In addition, this was his second attempt at the carbohydrate depletion/loading pre-marathon diet. In Manchester it worked perfectly – he passed thirteen International athletes during the second half and finished third (second Briton) in 2.15.06 to secure a surprise place in the British Team. Having recovered quickly, he managed ten 100 mile weeks, mainly at 5.30 per mile, and spent three weeks at altitude in St Moritz, coming down to sea level ten days before the Olympic Marathon. In Munich on Sunday September 10th, he paced himself very well and came through fast, moving from 30th at 5k to 8th at 40k. Ron Hill wrote in “The Long Hard Road”: “I glance round and get the shock of my life: there, head on one side (the left), black-rimmed spectacles, grimacing face, it’s Macgregor … He’s ungainly but Christ he’s travelling, he’s like a man possessed.” They passed Jack Foster of New Zealand; then Hill’s desperate sprint on the Olympic track left Donald to cross the line 7th in 2.16.34 – a very fine achievement and one of which the modest Macgregor is rightly proud. While Donald’s excellent record as a senior athlete thoroughly deserves much more than the above summary, this article will focus on his career after he became a Veteran runner at the age of 40. In 2010 Donald published a fascinating autobiography “Running My Life” and he has kindly permitted me to select material from this book. His first target was the 1979 IGAL World Veterans (nowadays Masters) track and field championships, which included a marathon, in Hannover, Germany. In the 10,000 metres “I covered the first 5000 in 15.10 or so. By that time I had a clear lead, and sped up gradually, finishing 53 seconds clear of Aldelagala (Portugal) in 30.04.2, my best for fifteen years.” In 2015, as far as I am aware, Donald’s time remains a Scottish Masters record. “On the podium, I was presented with the trophy by a Glasgow bailie, accompanied by organiser Bob Dalgleish. I was also handed a bottle of champagne, and in true Grand Prix style I shook it up and sprayed it over all those around, though I don’t think Bob Dalgleish liked it falling on his blazer!” Donald mentions that “The world champion tag got me some kudos in Scottish veteran running circles” and mentions Davie Morrison and Bill Scally particularly enjoying his win. 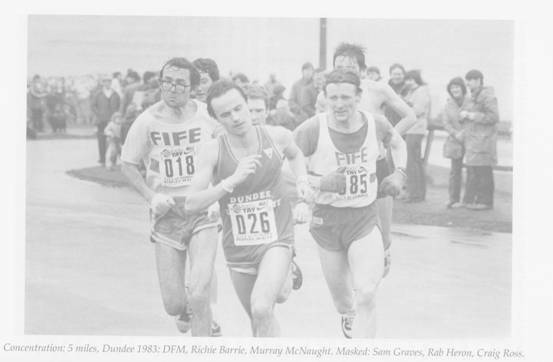 Almost three years (and seven marathons) later, on April 24th 1983, Donald lined up for the inaugural Dundee Peoples Health Marathon. He was determined to do well in the race and had trained seriously – averaging 70 miles per week over the late Winter and Spring. “Bang! A group of a dozen rapidly formed, going at quite a good pace – all the predicted favourites. I stayed in the group for five miles, taking it cautiously, then Richie Barrie and I found ourselves breaking away from Terry Mitchell, Sam Graves, Murray McNaught, Rab Heron, Craig Ross and the rest. Richie told me he would keep going till 15 miles and in fact kept up his helpful pacemaking role as far as 16, when he drew to a halt. Then I was on my own and had ten miles of mental concentration to go. I don’t think runners who are aiming to run four or five hours for a marathon realise how great is the concentration required to run under three hours, let alone 2.20. You have to stay focussed all the way. It’s possible to exchange remarks for a second or two, but best not to stop. Better to take sponges and drinks on the run, snatching a cup of water or juice and in some cases a special drink from the tables, and pour the water – but not the juice – over your head, wiping head, neck, face, arms and thighs with a well-filled sponge or two. I got to the top of the big hill at 21 miles with an effort, but after that my cadence became more fluent; I was able somehow to run more smoothly and on the downhill my stride lengthened. Gradually the lead over Terry Mitchell, who had moved into second and had been catching me, increased. At the finish it was over three minutes. On the video of the race, made by members of Dundee Road Runners, I look to be flying down from Lochee past the Dundee Royal Infirmary entrance, round the roundabout and round the shops into the finishing straight. Donald Macgregor’s time remains the fastest by a Scottish Veteran. Only Aberdonian Dave Clark (who moved to Southern England after leaving Aberdeen University) can compare, with his 2.17.30 as 1st Master in the 1983 New York Marathon and a win in the 1985 World Masters 25k road race. Macgregor continued to run very well for several years, winning Dundee again in 1984 and the Loch Rannoch event in 1985. He completed an impressive 21 marathons as a veteran, and of course was 1st Master in nearly all of them, including Glasgow, Aberdeen, Road Runners Club, Wolverhampton, Essonne (France) and Westland (Holland). Donald, as is well known, holds the Scottish record for running marathons faster than 2 hours 20 minutes. He completed 24 in all; seven as a veteran, including two after the age of 45. In 2015, his 2.17.24 is sixth in the runbritain all-time M40 marathon rankings; and the 2.19.01 (achieved when 6th in the 1984 Glasgow Marathon) is top of the M45 lists – four minutes faster than the second man! In cross-country, Donald won the Scottish Veterans M40 title in 1980 and 1983, M45 in 1985 and M50 in 1991 and 1993 – the latter event taking place in his home town of St Andrews and featuring a battle with old rival Mel Edwards. He kept on running, jogging and occasionally competing until very recently – but is still engaged in coaching with his beloved Fife A.C.
Back in the early 1980s, Donald Macgregor was President of the Scottish Cross Country Union and then SAAA event coach for the marathon: younger runners were very lucky to benefit from the friendly, crystal-clear advice of this intelligent, droll, self-deprecating man, who had so many years of top-class experience.